I lived my life backwards did great adventures in 20's and then stopped. It was a little too close to real life with all the distractions pulling me off my life course. The message: just because your dreams do not get to come true you get a consolation prize stung a bit too. 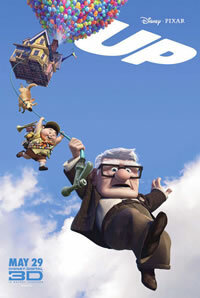 Up is about 78-year-old Carl Fredricksen who ties thousands of balloon to his home and sets out to fulfill his lifelong dream to see the wilds of South America. Right after lifting off, however, he learns he isn’t alone on his journey, since Russell, a wilderness explorer 70 years his junior, has inadvertently become a stowaway on the trip. It hits theaters May 29th. This movie looks like Pixar fun though a little kidsy. The trailers made me chuckle. This looks like it might be a good family movie to go watch. Pixar has a past record for quality, entertaining movies with good messages in them but not in a preachy manner. If I have time I would probably watch this in the theater. Toy Story: watched it, loved it, owner. A Bug's Life: watched it, loved it, owner. Monsters, Inc.: watched it, loved it, owner. Finding Nemo: watched it, loved it, owner, great gifts for others. The Incredibles: watched it, loved it, owner, great gifts for others. Ratatouille: watched it, loved it, owner, great gifts for others. Wall-E : on list to watch, have been told from many sources that I would love it. Let me know what you think. Watch the two trailers below and in the comments will you go to see up in the theater or rent it? If you have seen it in the theater should I go see it and why? Don't wait. Guarantee your seat before you go and avoid a sold out show. Skip the box office lines and buy movie tickets at Fandango.com.